Triple Trouble (formerly Red Reserve) are new to the Rocket League Championship Series (RLCS). The team was dominant throughout Season 6 of the Rival Series, stacking up a 6-1 record. Their hot streak continued with masterful performances in the Promotion Playoffs, where they qualified for the RLCS after taking down both Fnatic and Savage! in the Upper Bracket. Their success quickly attracted attention and after Red Reserve dropped the roster, Flipsid3 Tactics swooped in to add Speed as a replacement for Yukeo who had left to join Dignitas. 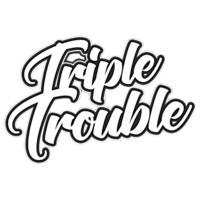 The remaining members, Ronaky and Tadpole, revived the Triple Trouble name and were soon on the lookout for a new third. It didn't take them long to settle on Kassio, whose striking prowess fit the team's needs perfectly. Since then, they've struggled to find consistency at the top flight of Rocket League Esports. Their moments of brilliance are often accompanied by puzzling miscalculations, but now that they've had some time to work on their synergy, the trio should be ready to cause some trouble in the RLCS this season.